This weekend, as part of the monumental task of trying to get the woodshop organized, I decided to tackle the ol’ drawer fulla sandpaper. 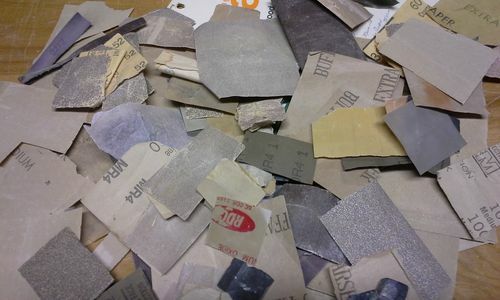 Why have I saved all of these little scraps of used sandpaper and emery cloth? Some of this stuff dates back to 1974! After taking this cel phone ‘glamour’ shot, it all got swept up and relegated to the dust bin. The remaining sandpaper stock, consisting of full, unused sheets sorted by grit, takes up only a small corner of the same drawer. Next stop: the cutoff and scrap wood pile…. 1974? Wow, that is some old sandpaper. I went through my sandpaper bucket and pitched almost all of the sandpaper in it. It was a great feeling, and now I can reach in there and get a good piece of sandpaper. It is so much better than sorting through the bucket in hopes of finding something that will work. Yeah can relate too. Little itsy, bitsy pieces of almost spent sandpaper stashed away somewhere in the shop because …........... I’m still trying to figure it out lol I’m going to follow your lead Ed.